Oh my! This berry basket, filled with old fashioned strawberry candies, is sure to be a favorite! We chose a talk given in the 2018 April General Conference, Small & Simple Things, given by Dallin H. Oaks to be included with our gift. President Oaks stresses the importance of choosing (or "picking") to spend our time wisely, especially those small yet simple things we do every day. 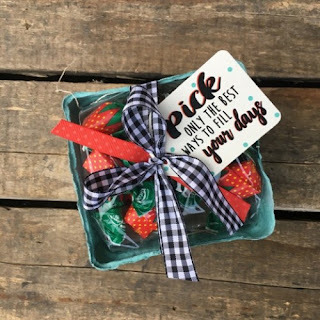 The tag on our gift says, "Pick Only the Best ways to fill Your Days" and is tied on with darling black and white gingham ribbon. Enjoy those sweet gospel truths as you minister this month! We also have a good selection of other ministering gifts as well as generic gifts to brighten someone's day! See our Facebook and Instagram accounts for updated merchandise! Or as always, stop in our Lehi store the browse our selection! Click the picture above to buy the berry basket gift online. Have a great day!